The Elementary Mathematics Project (EMP) is an NSF-funded project out of Boston University whose overarching goal is to develop and disseminate learning materials that strengthen pre-service elementary teachers’ understanding of mathematics. Learn More. Mathematical knowledge for teaching (MKT) refers to the “mathematical knowledge needed to carry out the work of teaching mathematics” (Ball, Thames, & Phelps, 2008). Simply knowing how to do mathematics is not sufficient; teachers must also know the mathematics they teach deeply and in ways that can help their students learn. The importance of developing this mathematical knowledge through coursework and professional development is undeniable (CBMS, 2012). In light of this need, our mission is two-fold: 1) to develop and test learning materials to improve pre-service elementary teachers’ mathematical knowledge for teaching; and 2) to develop and test instructor support materials to grow faculty expertise in using our learning materials in their content and methods courses. EMP has developed more than 30 lessons and corresponding support materials spanning 5 key mathematical content areas, or units. This work consists of two development phases. First, we developed, tested, and revised written lesson and instructor support materials to enhance a year-long sequence of two mathematics content courses for undergraduates who are preparing to become elementary and special education teachers. Second, we are now developing multimedia support materials (classroom videos and presentations) for instructors to assist them in enacting the EMP learning materials. The primary teaching strategy built into the EMP learning materials is the focused use of discussions and argumentation to further pre-service teachers’ ability to explain, justify, and generalize key mathematical ideas. Our written and multimedia support materials provide instructors of pre-service elementary teachers with detailed guidance on using discussion-based pedagogy based on research findings and our collective experiences using the EMP lessons. The Fractions unit consists of 10 mathematical lessons that explore important fraction concepts as well as fraction operations. Topics studied include the concept of a fraction, equivalent fractions, fraction comparisons, converting fractions to decimals, addition and subtraction of fractions, and multiplication and division of fractions. These lessons emphasize topics that are most relevant to the teaching of children in grades K-5, and are mentioned in the Common Core State Standards for Mathematics (2010). The Number Theory unit consists of 6 mathematical lessons that explore important number theory concepts and procedures typically studied starting in the elementary grades. Topics studied include factors, prime factorization, divisibility, divisibility rules, greatest common factor, and least common multiple. Emphasis is placed on developing a deeper understanding of the multiplicative structure of integers, a central concept in number theory that supports other critical topics in the elementary grades. The Geometric Measurement unit consists of 9 mathematical lessons that explore foundational measurement concepts as well as the justifications of key measurement formulas. 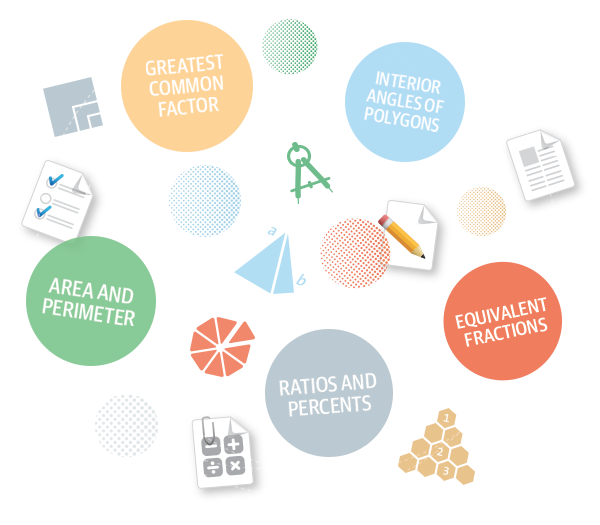 Topics studied include area and perimeter relationships, area concepts, area formulas, surface area, and volume. In the Mathematical Education of Teachers II (Conference Board of Mathematical Sciences, 2012) document, these topics are mentioned as ones that future teachers of elementary school students should have opportunities to study in depth. The Geometry unit consists of 11 mathematical lessons that explore core concepts in two-dimensional Euclidean geometry as well as solid geometry. Topics studied include sorting attributes, defining angle, parallel and intersecting lines, defining polygons, classifying and constructing triangles, classifying quadrilaterals, the sum of interior angles of polygons, tessellations, visualization with nets, and prisms. A running theme throughout the unit is on classifying shapes by their attributes. The Number Concepts unit consists of 6 mathematical lessons that explore important concepts related to the place value number system. Topics studied include characteristics of the base-ten place value system, different place values, large numbers, decimals, modeling decimal quantities, comparing and ordering decimal quantities, and representing fractions as decimals. There is an extensive focus on place value structure and modeling throughout the unit. The Addition & Subtraction unit consists of 7 mathematical lessons focused on the addition and subtraction operations . Topics studied include addition and subtraction story problems, addition strategies and algorithms, subtraction strategies and algorithms, and addition and subtraction of decimals. There is significant attention placed on number decomposition, number line modeling, and the arithmetic properties throughout the unit. The Multiplication & Division unit consists of 8 mathematical lessons focused on the multiplication and division operations. Topics studied include multiplication and division situations, multiplication strategies and algorithms, multiplication games, measurement and partitive division, division strategies and algorithms, and multiplication and division of decimals. Across lessons, there is an emphasis on array models and on the distributive property. A set of mathematical questions and corresponding solutions to be distributed to pre-service elementary teachers during instruction. A lesson follows a structure of recurring cycles of questions for small group and whole class engagement. Questions within each cycle are specifically designed to help pre-service teachers develop a deeper understanding of a key mathematical concept, procedure, or idea through discussion. A suggested lesson plan that contains clearly identified lesson objectives, materials, and timing. This document also provides guidance for how to launch the lesson, facilitate pre-service teachers’ explorations, and orchestrate whole class discussions. A set of suggested homework questions and corresponding solutions that accompany the lesson. Homework questions typically require pre-service teachers to execute relevant procedures, justify key concepts, and extend the ideas presented in the lesson to new situations. Our written and multimedia materials are currently unavailable for general dissemination due to on-going research and testing. However, we are currently searching for field testers for the 2018-2019 academic year. If you are interested in field testing our written and/or multimedia materials, please contact us at info@elementarymathproject.com. 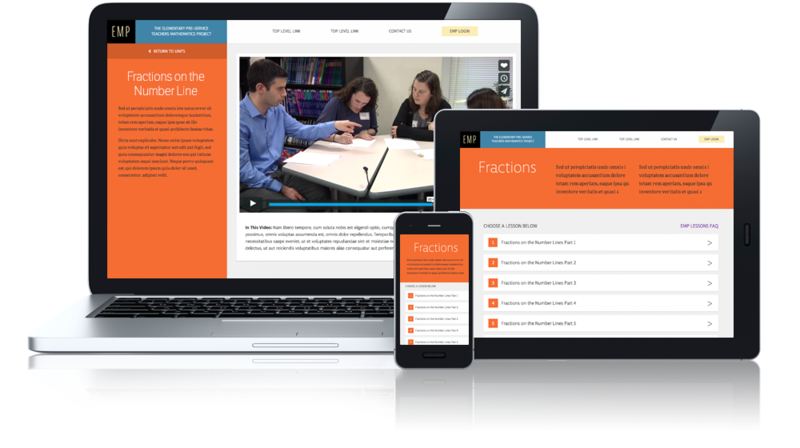 Each EMP lesson is accompanied by video and PowerPoint® presentation materials that serve as supports for instructors of pre-service elementary mathematics teachers. Short video clips ranging from 1-6 minutes show particular classroom episodes of EMP instructors enacting each lesson with pre-service elementary teachers. We offer a variety of video clips to illustrate ways in which instructors can develop and maintain effective classroom norms, use productive discourse strategies, and support pre-service teachers’ mathematical understanding and specialized content knowledge. Each video clip also contains written commentary by the instructors and researchers that can help users focus on important features of the classroom episode. With access to our video materials, users can search for classroom video clips by specific teaching practices or by EMP lesson.